Celebrate the last few weeks of Summer with our two new frozen dog treat recipes. As always, please provide plenty of fresh, clean and cool water for your dog to enjoy. Both of these treats were made in a brownie pop silicone mold. These molds are the perfect double duty baking equipment. You can use other dog themed silicone molds to make these treats, too. The first one, our Brrrrr Berry Pops, are perfect for the dog who needs to cool down, but not pack on the pounds. It has natural sugar and sweetness from the applesauce and is packed with healthy anti-oxidant rich blueberries. 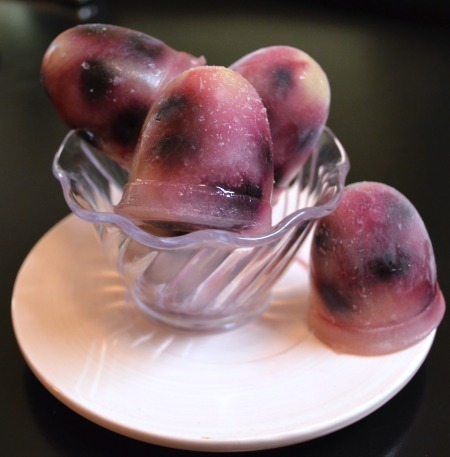 If you use frozen blueberries, they will create a pretty swirl when they meld with the applesauce base. Fill each cup of the brownie pop silicone mold with blueberries. About 5 berries per cup. The second treat, the Let's Go! Peanut Butter & Chia Seed Pops are perfect for a day full of activity. The peanut butter and banana combination is a flavor that most dogs will enjoy, so feel free to make it without the chia seed. However, the addition of the chia seed is one your dogs body will appreciate. 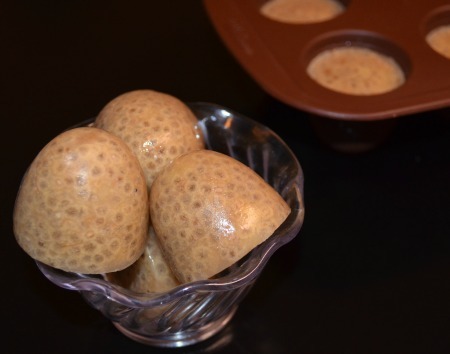 This super-food is high in fiber, has more calcium than milk and more than 3X the omega-3 fatty acid as salmon. Plus it is virtually tasteless, so your dog won't even know it's there. In a glass measuring cup with a spout, stir together the chia seeds and water. Let this mixture sit for at least 15 minutes. Thoroughly mash the banana in a small bowl. Place the peanut butter in the bowl with the banana and microwave them for about 10 seconds. This helps the peanut butter to become soft. Then stir together the peanut butter and banana until combined. Using a rubber spatula, scoop this mixture into the chia seed and water. With a small whisk, or a fork, briskly stir together the ingredients in the measuring cup. Next, evenly pour the thick mixture into each cup of the brownie pop silicone mold. 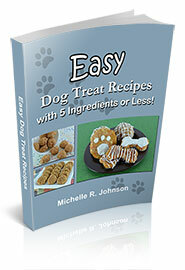 Cold treats, frozen treats or specialty treats can all make for a successful dog bakery business. If you've ever considered taking the leap from hobby to business, please read my review of a dog business eBook that may be helpful in making your new venture a success. Being holistic is not just for people. It is a very beneficial way of approaching our pets, too. We have complete control over their food, exercise and mental stimulation. Because of this, it is vital to consider what we can do to improve our precious pups life in any way we can. By changing even just one aspect of our furry friends diet, we can improve their quality and length of life. Homemade and healthy dog treats are just the beginning. Learn more about what it means to choose holistic care for your pets. "Our two dogs a German Shepherd and a Golden Retrieve love all your recipes and now only eat home made dog biscuits along with their raw diet. "My dog and all their friends loved these. Thanks again for these wonderful recipes. I never have to worries about my dogs with these wonderful treats."